NYS is attempting to repeal a longstanding tax exemption for businesses that utilize third party suppliers, or ESCOs, for electric and natural gas service. This repeal is estimated to cost NYS businesses an additional $128 million per year in sales taxes. Please follow the link to support the Business Council’s opposition to this new tax. Thank you for your help. ISO-NE has seen a slight upward trend in electric over the past few weeks. 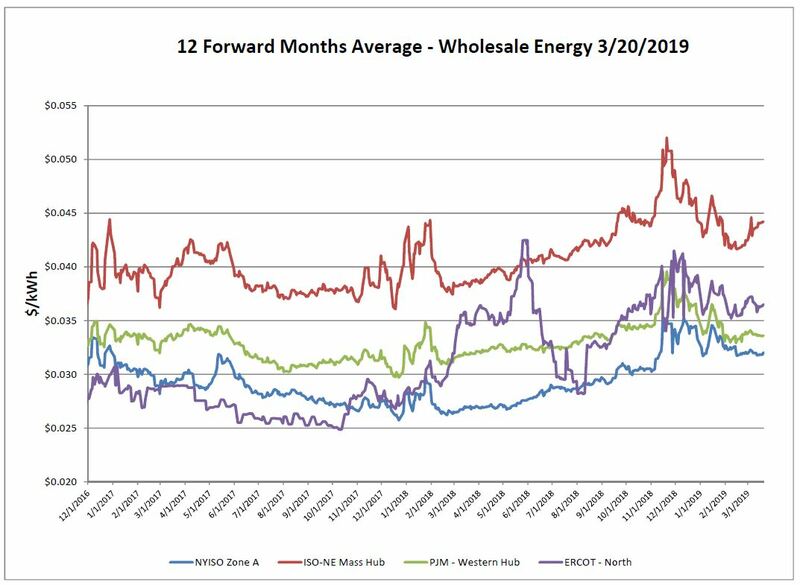 NYISO and PJM continue to remain stable and flat for the most part. The EIA reported that natural gas consumption in the electric power sector reached record levels in 2018 and is projected to set new annual records in 2019 and 2020 as well. 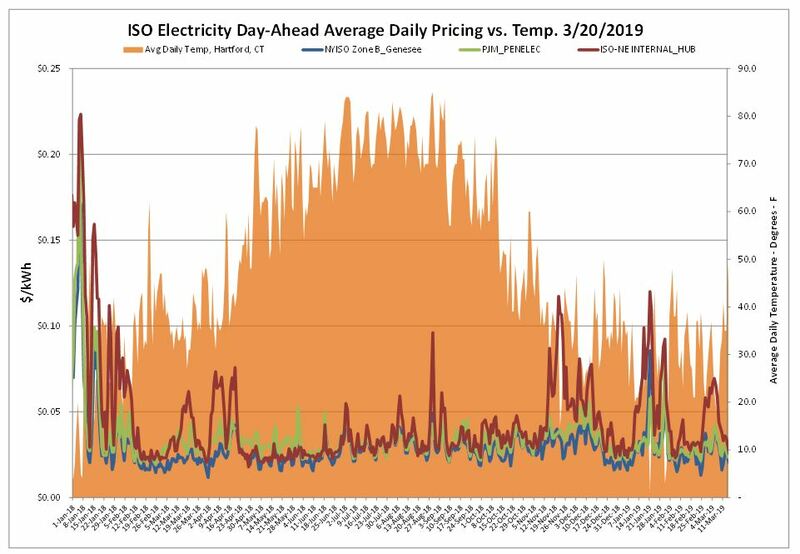 Summer electricity demand for air conditioning partly impacts power burn however some of the year over year increase can also be attributed to higher baseline usage of natural gas. Spring continues to be pushed further out, however the warmth that spiked and retreated over the report week allowed for little effect on the day-ahead market. 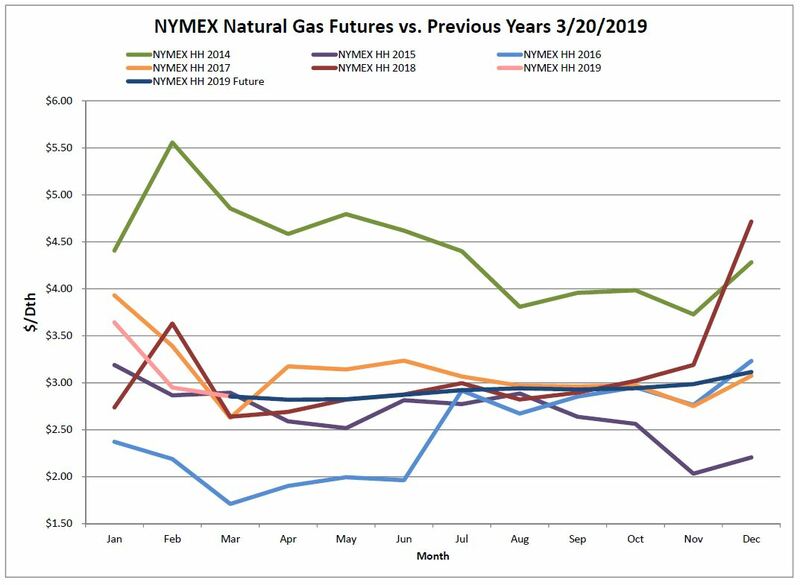 Natural gas was basically flat week over week. We appear to be in somewhat of a holding pattern right now. Little to no fresh news to swing prices one way or the other on the gas market. All eyes are focusing on natural gas production, as the market awaits a signal that production will continue to grow in the relation to sub $3.00 prices. The EIA reported a net decrease of 47 Bcf from the previous week. As of Friday, March 15, 2019, working gas in storage was 1,143 Bcf. This withdrawal is much lower than the 87 Bcf withdrawal reported this time last year, and less than the 56 Bcf 5-year average draw. Despite gaining some ground, storage levels are still around 20% lower than last year and 30% lower than the 5-year average. With the remaining draws from storage for withdrawal season, the US will have the lowest storage total since the 2013/2014 winter, and the 2nd lowest in over a decade. 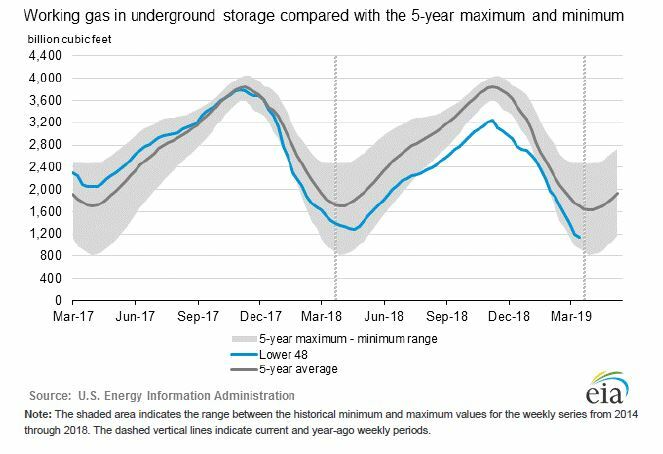 We’ll need natural gas production to continue to move higher if we’re to re-fill storage to an acceptable level prior to next winter. 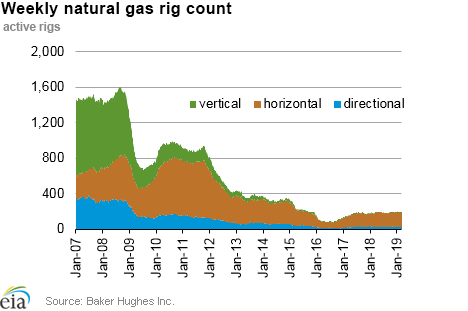 The Baker Hughes exploration gas rig count decreased 1 rig from last week for a total of 192 rigs. This is 2 more rigs than were in operation at this time one year ago when there were 190 rigs. 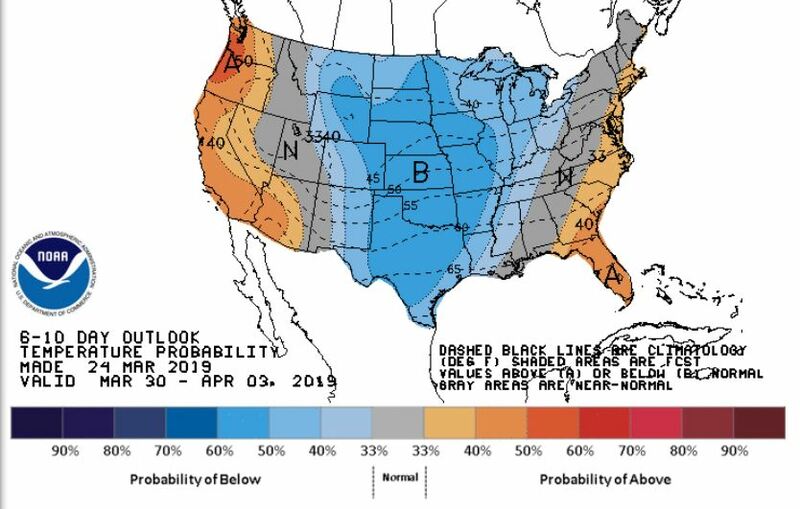 Milder conditions are forecasted for the next 2 weeks or so. The coasts may experience some slightly above normal temperatures while the weather in the middle of the country may be slightly below normal. The New York State Energy and Research Development Authority (NYSERDA) on Monday filed its energy storage implementation plan, which aims to incentivize deployments and help the state meet its 3 GW by 2030 target. Dominion Energy has secured a deadline day contract with Connecticut utilities for more than half the output of its 2.1 GW Millstone nuclear plant, saving the generator from what the company said was a coming retirement.